James Parsons was born in May 1862 at Nairne in South Australia. He opened a saddlery on a site next to the Blacksmith about 1880, having learnt the trade from his father. On the 11th. 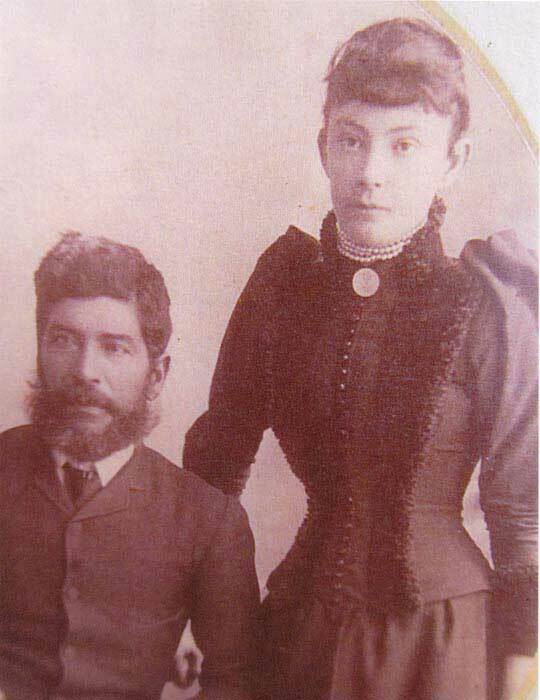 August 1885, he married Ruphina Bralla a Farina resident, at the Exchange Hotel. Ruphina was the daughter of Clement and Johanna Bralla. James played tennis with the Farina team, served on the committee of the Racing Club, involved himself in local matters, and was a member of the School Committee. James and Ruphina had twelve children of whom nine were born in Farina. Five of the children attended the Farina school. They moved to Hawker in about 1907, and died there. They are buried in the Hawker cemetery. Their oldest daughter, Bessie married John Nunan Wills at the Farina All Saints Church Farina on the 3rd. November 1909. John was the eldest son of John G. Wills, the then licensee of the Transcontinental Hotel. James and Ruphina’s youngest daughter Johanna Bralla Parsons returned to Farina in 1927 with her husband Fred Zbieske and two small children. They had a third child, and all three attended the Farina School. The family lived in the Parsons old homestead and when it was sold, they moved into Mr. Wills senior’s house which was next door to the Police Station. Clement Bralla and his wife Johanna were both born in Chile. After Johanna died at Beltana, South Australia in 1881, Clement and six of his children moved to Farina in the late 1800’s. He was an excellent horsebreaker, well known in the northern districts of South Australia, and drove the mail between Farina and Blanchwater. His daughter Ruphina, married the Farina saddler James Parsons in 1885 (see above). One of his sons Alfred Bralla who loved to go walkabout, became lost in the area and perished in November 1888. He is buried in the Farina cemetery. Louise Bralla, the youngest daughter married Thomas McPharlin on the 11th. November 1913 at the residence of Mr. S. Kite at Farina. Another son, Edgar Bralla (known as Jackson) was much involved in sporting activities including tennis and on the committee of the Racing Club. He enlisted during World War I at Blinman where he was born. He died of wounds in France in May 1917 and is buried at the Grevilliers War Cemetery in France. Clement Bralla remarried Martha Dedman at Farina on the 1st. January 1891. (see image opposite). He died at Port Augusta on the 4th. June 1918. The Parsons sisters – Marj Lamey on the left. 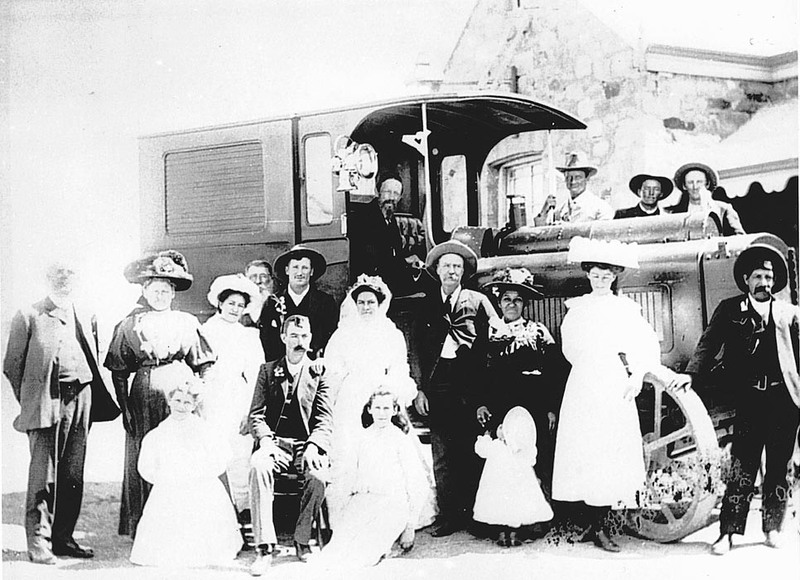 Bessie rode to the church on the decorated engine of the Renard Road Train. It had been imported by the Union Consolidated Copper Mines to carry ore from Yudanamutana. It later fell into disuse, but has been privately restored, and has re-appeared at Farina in recent years. Johanna (Dolly or Doll) was born at Farina, living there for a short time before moving to Hawker. I remember my father (Doll’s brother Bill) telling me that she looked like a little doll when she was born. So we always thought that is how she got her name. One of her sons thought she must have been a cute child. Dolly married Frederick Gerard Zbierski, (born 18 July 1902, at St Mathew’s Church, Quorn). Having kept house for her brother Edgar for a number of years, he bought her a lovely dress for the occasion of her wedding, a gesture which Dolly recalled to her family later in her life. Fred had moved from Adelaide to Farina after he was discharged from the army for being under age. He had enlisted as an 18 year-old but in fact was only 16, which was discovered. When he and Doll met, he was employed as a stockman and bullock team driver in Hawker. Fred obtained work fencing on a pastoral property at Mt Lyndhurst, South Australia, and Dolly went ‘bush’ with him. Early life was not easy. They lived in tents, one to eat and live in and the other for sleeping. Cooking was done on an open fire, with only camp-ovens for cooking roasting, boiling, and even making bread and cake. Kerosene lanterns were their only lighting, and drums of water for all their needs were carried by wagon as they moved along the fence as the job progressed. Water was heated in kerosene tins over an open fire for washing and bathing. Having two little children (Brian and Fred), and living in tents with only dirt floors, and nowhere to bathe except the wide open spaces, was another home comfort she missed. It was also extremely hot in the far north of South Australia, especially exposed as they were, with little annual rainfall. But with work so difficult to obtain in small country towns, there was no alternative if she was to live with her husband and family, which was the established custom in those days. Having a team of mules and a wagon to transport men and materials along the perimeter of the property, life was very busy for Fred also, caring for his animals and maintaining his wagon. He treated his mules with great respect and indeed was never known to draw a whip on them, even when they became stubborn and disobeyed orders. With no means of keeping food cool and fresh, salted meat (usually beef) was somewhat of a staple meal, together with damper and potatoes. Potatoes and onions were the only vegetables which did not deteriorate quickly, so meals became quite mundane at times. Fred had several men working for him. So Dolly did not only have to care for her own family but had to cook for the workmen as well. She recalled that one day they had gone off to work in the wagon without the ‘crib-box’, a box in which they carried their lunch. Putting young Fred on her hip, the crib-box in her other arm, and with Brian toddling alongside, she set off on a hike quite a few miles across a stony paddock so that the workmen could have lunch. Such was Dolly’s loyalty and compassion from an early age, and she retained it throughout her life. Whilst in the sand-ridden home in the bush, eye complaints were prevalent. Dolly was subject to a condition known as ‘sandy blight’ which left scarring behind her eyes. Although the children were not subject to many of the children’s diseases encountered in the city, children from the bush were especially prone to eye problems. Heading back to Farina in 1927, Dolly recalled that they were hurtling very quickly along in the wagon when she realised they had almost arrived at the creek. She yelled out just in time for the horses to be controlled to get them all safely across the creek bed. She felt sure they would have all been killed had the heavily laden wagon crashed through the creek. During the time that Fred and Dolly were in the bush, Dolly’s father passed away suddenly at Hawker at the age of 65. Not being easy to contact, she did not know of her father’s death until well after his funeral. Having had no mother from the age of eight, her father had filled both roles, and Dolly was saddened to return home with much emptiness in her heart. In Farina Dolly and Fred lived in the Parson’s old family home, and when it was sold, they lived in a house that was owned by Mrs Wills senior (a family friend – known as Granny Wills) which was next door to the local police station. Although the house was a great improvement on the tents in which they had lived, there was still no electricity or running water in Farina. So hardships were still encountered with only a small rainwater tank and few conveniences. Even in Farina it was very difficult to keep food cool with only a water-cooled safe and little fresh meat and vegetables available. Dolly had always cooked her own bread, and when the local policeman’s wife came from the city to live in Farina, she loved to swap the occasional loaf of Dolly’s lovely high-top loaves for a soggy baker’s loaf which came up by train from ‘down south’. Once a year people in Farina were treated to strawberries and ice-cream, especially brought up for the strawberry fete in November. The ice-cream came in containers which were well insulated to keep it from melting. All the locals really appreciated the treat, even if only once a year. Another annual event was Guy Fawkes Night, including a bonfire with lots of fireworks with dads letting off ‘bungers’, scaring the small children and some of the mums and pet dogs too. A popular outing for the families was the Fancy Dress Ball. A family friend, Marjan Mahomet, who was a talented dressmaker, made many different costumes for all the children and secretly dressed them up in order to surprise their friends and families. The schoolchildren also had a picnic once a year when all the townsfolk would gather in the local creek (Leigh Creek) to race against each other for prizes such as a ‘penny’ or a sweet. Following the races one of the committee would lay out a tarpaulin on the ground and climb up into a big gum tree and throw down handfuls of sweets for the children’s ‘lolly scramble’; sometimes it would even be oranges as well as sweets, as oranges were quite a delicacy up north. After the races all the families would partake of a morning tea consisting of special cakes for the occasion, especially Albert cake with feathered chocolate icing, which was made by the well-known Balfours Bakery still operating in Adelaide today. Being isolated in the bush, another event which brought people together was when the travelling Wirth’s Circus pitched their ‘big top’ near the dry creek bed. Children who had never been south to the city or big towns revelled in the occasion, even if it was few years apart. As Fred was not able to obtain work in Farina, he worked as a station hand or shearer on some of the surrounding properties, and Dolly was left on her own to bring up her family during the Depression years. With no work or money, life was not always easy, but there were many other people in similar circumstances. Although she did not have very much money, she accepted her situation and was never known to complain about being poor. Dolly did some housework for one of the shopkeepers in order to help pay for some of their groceries and needs of the family. For a few years Fred obtained work with a family friend, Bill Long, who had the Royal Mail contract to Birdsville. Fred drove a trusty ‘T-model Ford’ and often told of harrowing trips to get the mail through, especially conquering the shocking roads and the endless sand dunes with often no roads or land marks. Of course, when the rains came the problems changed, but were no easier. It didn’t rain very often in the north of the state, particularly in Farina where it rained perhaps only once a year, except one year when about five inches were recorded. Despite the lack of rain, it was usual for mushrooms to spring up following the rain. Many of the townsfolk, including Dolly and her children, would head for the creek to collect them, but she did not eat them as she had been poisoned by eating a raw mushroom when she was a little girl. Needless to say, fresh mushrooms were never on her menu after that, and she warned her children of her own childhood dilemma. During those early years in an isolated far-north town, Dolly experienced much loneliness, especially when her young children became ill. Not wanting to contract childhood diseases, townsfolk kept their distance from families where there was illness. Dolly recalls that when three of her children had whooping cough, nobody would come near the home. With her husband away working, she had to manage the dreadful disease as best she could. One of the boys would get delirious and see things ‘crawling up the wall’, while another would cough constantly until she would completely lose her breath and become unconscious. Before she was married, Dolly had all her teeth extracted because of gum disease, and after 13 years she and Fred felt they could afford for her to have false teeth. But with no dentist in Farina she sent to a firm in Sydney which advertised ‘False Teeth by Mail’. All the necessary metal shapes, sealing wax and emery paper and instructions were sent to her to take her own impression. She then returned the hardened wax to Sydney for the new set of teeth to be inserted. Dolly solicited the help of the local district nurse who claimed that “taking impressions for false teeth was not in her duty statement”. So Dolly took her own impression with the wax having to be heated many times before a satisfactory impression of both jaws was achieved. The set of teeth duly arrived from Sydney and after removing small imperfections with sandpaper and chewing a lot of chewing gum she became accustomed to them; Dolly enjoyed her lamb chops like never before. The local stationmaster, who also had false teeth, brought around some walnuts and the local policeman some crisp apples for her to try out with her new teeth. This was certainly a great occasion in the little township. It was not until she was well in her seventies that she was convinced that she should get a new set of teeth. The dentist couldn’t believe she had taken her own impression and, indeed, that she was still eating with 50 year-old false teeth which were purchased by mail. She was able to produce a receipt for five pounds—or was it eight pounds—to prove it. In fact she had only two sets of false teeth during her lifetime. During his time in Farina, Fred stabbed his thigh with a knife while cutting leather. Of course there were no telephones, and Dolly had to race off to the District Hospital for assistance whilst Fred held this thumb into his thigh to stem the blood spurting from the wound – a very traumatic experience for them both! To their horror the ‘old English nurse’ said she would have to have a ‘bath’ before she could come to attend the patient, even if he was bleeding to death! Just another memory which was recounted to her family as the years went by. 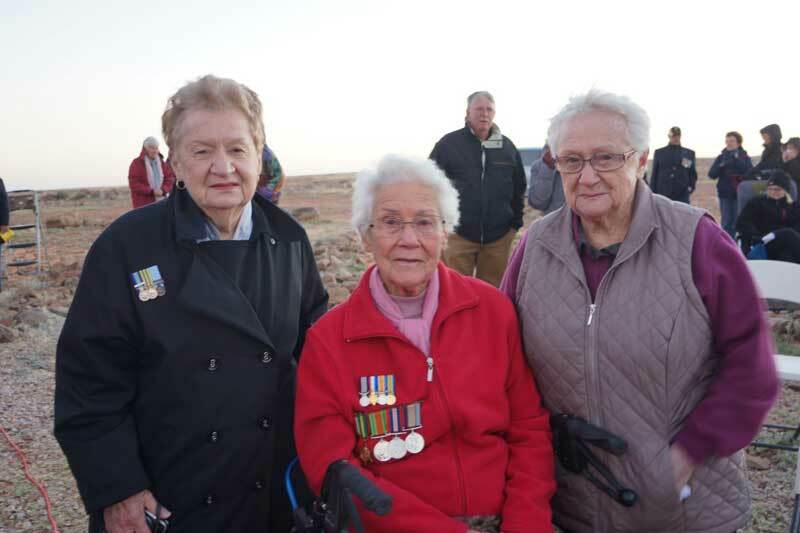 In late 1930s, Fred went to work on a mica mine in the Hart’s Range near Alice Springs, and Easter and Christmas were the only times when he was able to come home to spend time with the family. However, making her own fun, Dolly enjoyed playing tennis on the dry lake bed at Farina, which was also used as an aerodrome. She was always very keen on playing cards, especially euchre, poker and crib. She was, however, not encouraged to play bridge very often because the local policeman insisted on being her partner, which meant that he would dominate the game by trying to call the winning bid every hand! Dolly recalled that she was bitten by a dog when she was a young girl, and while in Farina, her daughter Gwenda was also bitten by a blue healer dog owned by the Mahomet family. Gwenda went to have her ‘hair done’ to go to the local school picnic when the dog, which had seen her often came flying out from the verandah and grabbed her leg. The local District Bush Nursing Sister, attended to her leg which had became septic and ‘was green’ when Dolly saw it. Advice had to be obtained over the radio on how to treat the infected leg.